During the Holocaust, Terezin (Theresienstadt) Ghetto in Czechoslovakia was a waiting station for the Nazi death camps. Fifteen thousand Jewish girls and boys passed through the gates of Terezin. A few more than one hundred survived. I want to fly, but where, how high? These works inspired Canadian violinist, Ruth Fazal, to compose “Oratorio Terezin” for full orchestra, adult choir, children’s choir and soloists. It very beautifully expresses the voices of the Jewish children, of God, of Suffering, and of the Hebrew scriptures. Ruth Fazal describes it as “a love song… a message of hope, composed in the context of so much darkness”. 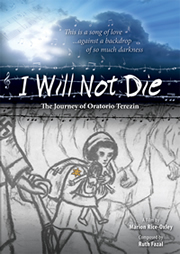 Filmed over three years, this compelling and powerful documentary includes us as part of the journey of Oratorio Terezin, a journey that profoundly changes the lives of everyone it touches. We are intimately involved, from the children’s choir auditions for the Premiere performance in Toronto, Canada, to behind the scenes in the grand venues of Vienna, Prague, Bratislava, Brno, to visiting Terezin, and ultimately to the performances in Tel Aviv and Jerusalem, Israel. The children initially simply sing the words of those who died, but as their own lives are transformed by their experiences on the journey, they become their voice. While paying tribute to those who perished, this is a rare story offering an affirmation of hope, an inspiration that lives on in all who see it.